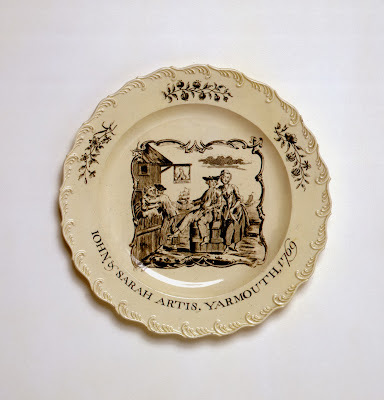 Plate, John Sadler, 1769, National Maritime Museum. 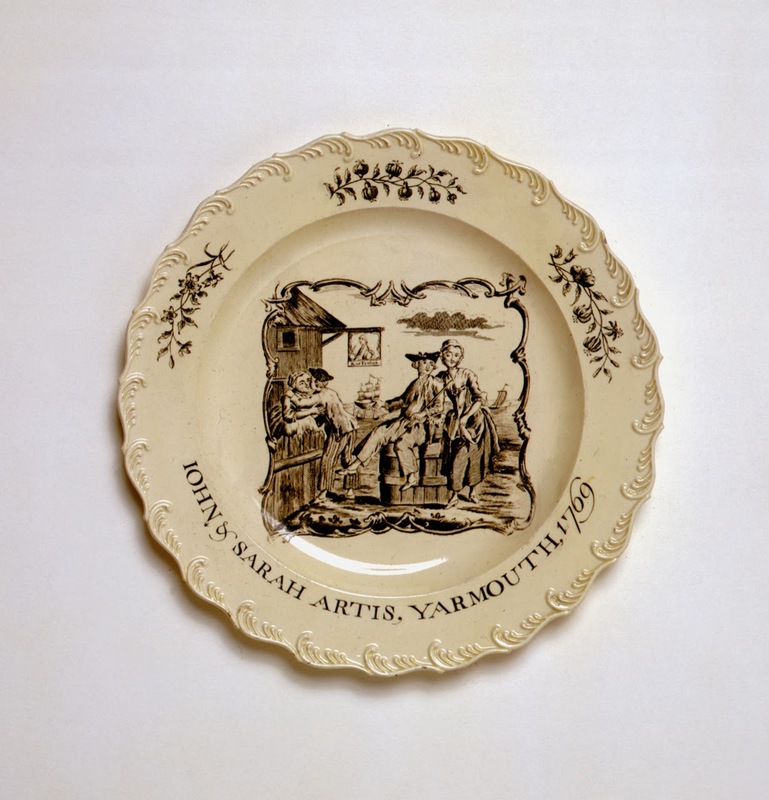 This transfer printed creamware plate is an intriguing piece. The names ascribed to the bottom have been traced by the wonderful researchers at the National Maritime Museum, who traced John Sheldrake and his wife Sarah Artis. I would assume this plate was a commemoration of their wedding in March, 1769. Oddly, the man's name is not used, but the woman's is. According to the catalog entry in the National Maritime Museum, John Sheldrake was illiterate. It may be that Sarah was marrying below her station, and the plate gave more acknowledgment to her than to him because of this. But that is only one of many plausible theories. What do you think? 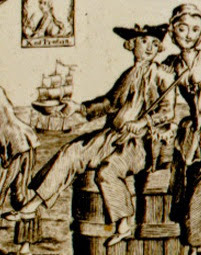 In the center of the piece a sailor sits atop a barrel, leaning against his love. He cradles a stick in his left hand. Atop his head is a cocked hat with a cockade on the right side, and trimmed in narrow tape. There is no waistcoat over his shirt, and his single breasted jacket with waist pockets and slash cuffs hangs open. Plain trousers end well above his ankle. To the left and beneath the sign of the King of Prussia is a sailor leaning over a fence to plant a kiss on the lips of a handsome lass. Like his mate, he wears a cocked hat, though this is untrimmed and without a cockade. At that, the hat is smaller, befitting the "apple pasty" style common to sailors. Unlike his mate, his jacket is shorter and without waist pockets or cuffs. It probably has three vents along the back, but the angle and shading make it a bit unclear. It may be only a single vent at the center back. Striped trousers complete this jack's slop clothes.